The Maruti Swift 2016 has all black interiors, this has been done to make it look trendy, when compared to the Swift DZire that has black and beige interiors. This has been done on purpose to separate the audience and their liking. The Maruti Swift 2016 has a three-spoke steering wheel with twin dials for the instrument cluster, a centre console that has an integrated music system with bluetooth connectivity, USB and aux too. The Swift now even has reverse parking sensors, push start and stop and even keyless entry. The front row seats on the Maruti Swift 2016 are large enough for six foot adults and this makes it a great option to consider. The rear seats on the Swift are a bit tight when it comes to knee room and even the boot size at 204 litres is extremely small. The rear seats fold with a 60:40 split. This is unique on the Swift in this segment at least. The Swift doesn’t have rear AC vents. The Swift has good storage places with space to keep your smart phone, keys and other knick knacks. The front door pocket can house a one litre bottle, while the rear can fit a half litre bottle. There are cup holders also in the front. Coming in both petrol and diesel engine options, the Swift has total six variants: Petrol – LXI, VXI and ZXI Deisel – LDI, VDI and ZDI The petrol version of the car derives its power from the 1.2-litre KB12 unit that has a displacement capacity of 1197 cc, while the Swift diesel has the proven and potent 1.3-litre multijet motor under its hood. While the petrol mill has an MPFI (Multi Point Fuel Injection) system, the diesel engine has a 5-step Multi Injection CRDi system. When it comes to performance, both the units are powerful and responsive. With a 16-valve DOHC (Double Over Head Camshaft) valve train and four-cylinder set-up, the petrol mill churns out a maximum power output of 85.8 bhp and 114 Nm of peak torque, making it one of the most powerful engines in its segment. The oil burner 1.3-litre diesel unit too is equally impressive with 74 bhp and 190 Nm. Despite being a hatchback, the Swift is one of the few vehicles in its segment that is as good for highway driving as it is for driving in the city and that has been the reason behind its popularity everywhere. Both the 1.2-litre K-series petrol and Fiat-sourced 1.3-litre multijet diesel versions won’t disappoint you in this department. You will love throttling them. Having equipped with a five-speed manual transmission, the Swift petrol touches the 0 to 100 kmph mark in about 12 seconds. That is the case with the Swift dieselas well. Even it does the same in about 12 seconds at a top speed of 150 kmph. Despite having much better ride quality than most of its competitors, the Swift isn’t as ‘swift’ as its rival Hyundai i20, especially till the third gear. But as soon as one enters the fourth gear, it gives you a sense of stability and sportiness that you would just like to rev it hard. 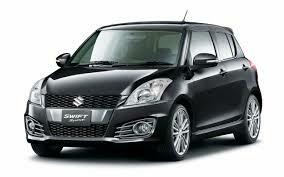 As mentioned above, the Swift is available in both petrol and diesel engine options. The 1.2-litre K-Series VVT petrol mill coupled to a five-speed manual transmission pumps out 85.6 bhp at 6000 rpm and 114 Nm of peak torque at 4000 rpm. The 1.3-litre DDiS diesel engine, on the other hand, mated to a five-speed manual and turbocharger, belts out 74 bhp at 4000 rpm and 190 Nm at 2000 rpm. So in terms of power, both the engines are impressive and in fact better than most of their competitors. What impresses more is the improved NVH (Noise, Vibration and Harshness) level; the designers have worked really well on insulation that one doesn’t feel any noise inside the cabin. Another aspect that hasn’t changed, and for a good reason too, is the drive dynamics. The new Swift comes fitted with what MSIL calls RBSS, basically a rally based suspension set up. With learnings from JWRC and our very own Indian rallies such as Desert Storm and Raid de Himalaya, the suspension system has been designed to be robust yet offer a rather decent ride quality. Push the car around a tight corner and she holds her line extremely well. No doubt the larger tyres have a role to play here, but there is more to the story than meets the eye. Despite an increase in size, the new MSIL Swift is 30 kilograms (petrol version) lighter than its predecessor and the diesel manages to be 15 kilograms lighter. A better stance and a lighter body also contribute to the Swift’s engaging driving dynamics. The new Swift is bigger and bolder than the outgoing one, but is it better? It’s made a huge leap forward in terms of practicality with a much bigger boot and a more spacious cabin. With families getting bigger and more demanding, extra space is always welcome. But the Swift isn’t really meant to be a family car. It’s for individuals who drive themselves most of the time and, to that end, the new Swift, though it may be quicker, hasn’t bettered the old car’s fun-to-drive desirability. Where it does add a bit of excitement is with its styling which is even more striking than before. To be launched in early 2018 and sold through regular Maruti channels – which means it will be competitively priced (and not have a Nexa premium) – the Swift is sure to be another runaway success. It’s just that the character of the previous car is missing.